Yesterday, I was on the phone. My kids are pretty good about not interrupting me, because I'm not much of a phone talker, so if I'm using the phone chances are it's actually something important. So I wasn't surprised to see my daughter Kay handing me a note. And I gotta tell you, amazing they were! Note: The bugs weren't that amazing. Also, there was only one bug. And it wasn't actually a bug it was a moth. Still, I respect her ability to write a strong lede. Gotta love when they take such a smart approach! 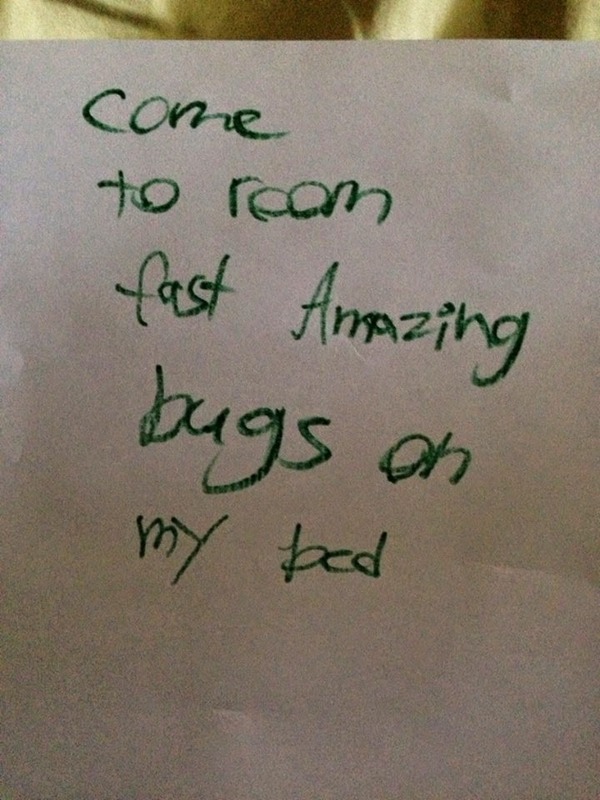 I just showed this to my 5yo and told him that "fast amazing bugs" are the exception to the rule regarding phone call interruptions... So, thanks for that.